In this lesson, we will learn about complementary angles. The math video below will explain more on this. In this lesson, we will learn about comp. angles. Let's take a look at these two angles. 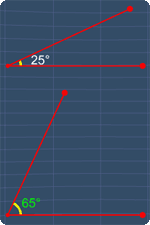 Notice that, when we add these two angles, we get 90 degrees. Seeing this, we can say that these two angles are comp. angles. Now, when we rotate this arm, these two angles must add to 90 degrees, to remain as comp. angles. Adding 15 degrees with 75 degrees, gives 90 degrees. Adding 67 degrees with 23 degrees, gives 90 degrees. Now, let's see some examples. To find out, we just need to add 12 degrees with 78 degrees. This gives 90 degrees. Hence, these are angles that are complementary. Next example, these two angles are comp. angles. Find x. We know that, when we add these 2 angles, we must get 90 degrees. 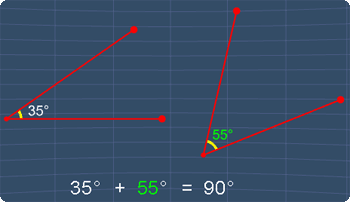 Hence, we can find 'x', by subtracting 90 degrees, with 73 degrees. Therefore, ‘x’ will be equals to 17 degrees. You can start by going through the series of questions on complementary angles or pick your choice of question below.